As Rebecca's hostess today I had a few questions for her. 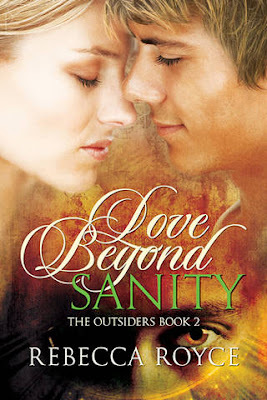 How did you come up with the title Love Beyond Sanity? Every book in the Outsider series will start with the words Love Beyond. The first book, Love Beyond Time, was titled because that was Isabelle’s particular power and because their love had sustained over time and distance. For each title, I tried to come up a reason that the last word would be present in the title. Love Beyond Sanity refers to two things. Number one, Charma’s particular talent is healing the emotional burdens of people with mental health issues. She gets into their heads and removes their burdens. The problem? She carries part of their pain with her and begins to question her own mental health. Jason doesn’t know he’s an Outsider so he assumes his ‘delusions’ are just that: delusions. Being a man used to logical deduction, he simply decides to stop having them, which is how he ends up abandoning Charma at the beginning of the story. She assumes he is long dead. Thus, Sanity seemed to be the most logical title. I think of each of the books by the last word in their title. Name five things in your bucket list. Italy, Greece, China, Australia, and St. Lucia to name a few. What's the hardest thing you've ever had to overcome? I’m dyslexic. I don’t know that I’ve overcome it but I’ve learned to compensate for it. I think that’s been pretty tough. If you could bring back one person who's passed away, anyone, who would it be and what would you ask them? It doesn't have to be anyone you knew. I miss my father-in-law. I’d like to bring him back just to say hello. Siamese Cats. I grew up with them. I love them. My Mom. I think she’s just a great lady. What's the one thing you do to pamper yourself?Hot baths and red wine. What's your favorite movie of all time and why? The Usual Suspects. I just think its so perfectly done. If there's one thing you could do over again, differently, what would that be? Um. How do I pick just one?? 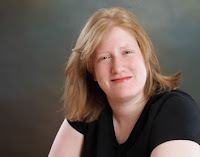 Blurb - Eighteen years earlier, Charma lost her destined soul mate. Convinced he must be dead, she kept her fears to herself so as not to destroy the morale of the Outsiders who already live with a shaky prophecy as their only guide. Dr. Jason Randall is a man used to getting what he wants. There has never been a problem he couldn't out think or a situation he wasn't capable of handling. Now they are both hunted by not one but two demons as they lead the slowly forming group of Outsiders out of the darkness and back into the light. The two strong souls will have to decide if prophecy alone is enough reason to stay together through insane odds...or if love is their true fate. Excerpt - No, she was not nuts. He was here. The nameless man—she'd never learned his name—who had been made for her, chosen for her in heaven was in this room. And, she had felt him die. Felt it the night he hadn't come to their secret garden. It had been like someone had taken a sledge hammer and demolished half of her body and soul with one hit. She'd known he was dead. Alone. That was how she'd felt. With other people's problems filling her days, nights, and dreams. Had he been this way since he'd disappeared when he was twelve? Charma's eyes roamed his body for signs. Impossible. He looked too healthy. Muscle tone defined his body. He didn't look like a man who had been endlessly asleep on a bed. His eyes fluttered as if he was in deep REM sleep. She cleared her throat, afraid to wake him but wanting to at the same time. "Hello." Nothing. Charma's cheeks warmed. Why had she assumed he'd respond to her? He was in a coma for goodness sake. She was going to have to do more than speak aloud to get his attention. That is a great question & answer about the titles. When you explain it, it makes perfect sense. I like that. This is why you follow a tour around: the snippets you glean along the way. Enjoyed the Q&A today. I'm laughing that you have 'The Usual Suspects' as your favorite film. I loved the part with Kaiser Soze in the squad room making up his statement from items he read on the walls. Only this week, I was watching a new TV program "Unforgettable" where they used that same thing. The witness they were questioning was making stuff up from what he saw on the walls, etc. When they figured that out, they realized he was their perp! Great stuff is always classic! Enjoyed reading your post and finding out how you come to name the titles in this series. love the cover, it's gorgeous and the excerpt was great. i can hardly wait to read the rest of the book and see what happens next. Great interview! I am looking forward to reading this new book! The blog is really a good stuff for lovers. What a great interview I look forward to reading this book sounds so good! Thank you very much for the great blog tour! Your titles are perfect. Love is all that. Thanks for the giveaway! Sounds like you & I would have been great friends in school. I've not taken the plunge into writing, so my mother still thinks I waste a lot of time & money on romance books. I did catch her reading a book on my Kindle the other day, so maybe there is hope for her yet. Great interview, I loved it. Thank you!